The concert is a celebration of all that ‘Jazz at the Nassau’ has accomplished over the past decade, in serving as a regular platform for local and international artists alike and allowing them to explore every nuance of this profound musical genre. This 10th Anniversary live DVD recording features the unique fusion of two of Cape Town’s finest piano trios, going head to head in a groundbreaking simultaneous performance. 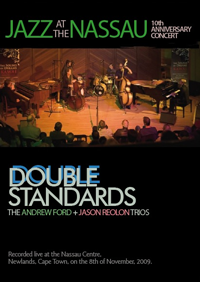 With a fresh take on some of the world’s most beloved jazz numbers, Double Standards is a tour-de-force of musical mastery, certain to provoke, inspire and entertain. Recorded live at the Nassau Auditorium in Cape Town on 8 November, 2009.